On April 11th, 2012, a photo with the title of “Yuri suffered humiliation in autograph” was published on the Internet. The published photo is a note by a fan who wants to get the signature of the lead actors in SBS TV drama series Fashion King. 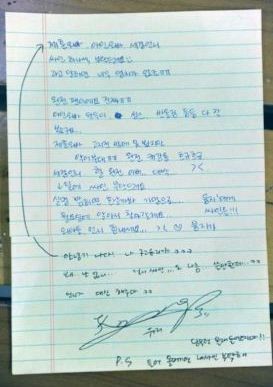 However, the note did not request for the autograph of Girls’ Generation member Yuri. But the SNSD member Yuri was undaunted, and she voluntarily left message and signed the autograph, attracting attention. Yuri wrote: “Hello? I am Yuri. Why there is no my name? My signature looks just fine. I volunteered to sign for you.” And then she left messages for the fans who were sneaking into standby room and studio, “Next time don’t come in secretly! P.S: If you come in, do ask for my autograph,” provoking laughter. Many netizens commented on the photos, “Why only the name of Yuri was left out?” “Yuri is cute,” “Seeing the message of Yuri, surely the fan will become fan of Yuri,” and so on. Currently, Yuri is starring in SBS TV Monday and Tuesday drama series Fashion King, playing the role of fashion designer Choi Anna, performing the acting activities with passion and enthusiasm.